Here are the steps you need to navigate the software licensing minefield! Software Asset Management (SAM) is one of the key components to any successful company. SAM helps your company save money, ensure data security, and increase productivity. Under the umbrella of SAM, the most important part is a company’s Software License Management (SLM). Software License Management has long been known as a minefield, scaring companies with its multi-faceted nature. Nonetheless, SLM is vitally important to any organization, so it is imperative to understand both its nature and its consequences. What is SLM and why is it so complicated? SLM is a maintenance plan for managing your company’s software licenses. In and of itself, it doesn’t sound that complex, but a closer look at the details of SLM will help you understand what makes it such an explosive minefield. Internet: This type includes companies like Facebook and eBay which don’t charge you for use of the site but do monetize advertisements or transactions. Software as Service (SaaS): This method is most common with licensing companies that have gone public since 2000. Software is only deliverable as a cloud service, and upgrades are standardized across the field. The cost structures for such a method are much lower. Traditional: The license fee is paid by the customer one time for the right to use the software which makes it one of the most successful license types. Vendors usually charge between 20-30% for support and maintenance fees. Outsourcing: With this type support and maintenance are outsourced by the vendor to a third-party company but customers buy the software from the vendor. Hybrid: Customers purchase the software licensing from the vendor, who then takes care of not only support and maintenance but also software asset management. Open source: Vendors charge for support and maintenance while the customer gets to use the software for free. Not only are there multiple agreement types, but there is also a myriad of license types which must be strictly followed as part of your SLM procedures. From per device licenses that are used only on one machine to per user which provides a unique login to one user and allows them access to multiple devices to the network license that cover all machines within your WAN and LAN. Subscription-based allows both user and device licenses and is managed by a subscription with an end date specified in the subscription terms. A cloud-based credits subscription is a sub-type of subscription hosted in the cloud. General public license (GPL) and software come with no charge and these licenses can used, shared, copied, and modified for free. Client access license (CAL) allow users to connect to a specific server to access installed software. Capacity-based license is determined by the configuration metrics such as the CPU, hard drive, or other hardware configuration elements. Freeware is free to use, and the creator of the software will hold the copyrights. If it’s not clear enough already, each vendor brings with it a different approach to licensing software, often with multiple complex agreement types. The legality must be understood in order to ensure compliance with the vendor’s restrictions. If your company is audited by the vendor, there are serious financial consequences for being out of compliance. This brings up another reason why SLM is a minefield: it is a monumental task to be compliant, especially if you are trying to manually track software assets and license usage. Furthermore, a vast majority of organizations believe they are currently paying for either under-used or unused software, increasing their frustration with the whole process. And they are right. Unused software costs company several million dollars yearly. It has been estimated that around 38% of software is wasted and goes unused after it is installed. There are endless licensing combinations and companies don’t know which ones best suit their business needs. 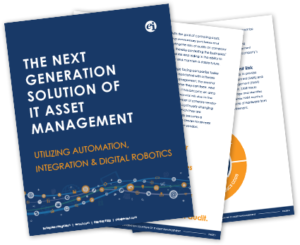 For these reasons, it is imperative to invest in an automated asset management solution that addresses SLM issues. Instead of attempting to manually track which licenses being used, invest in a solution that employ fully automated license harvesting. These solutions save money on maintenance costs and unnecessary licensing fees on unused software. Furthermore, SLM will strengthen your data security by reducing the volume of new licenses that need to be purchased as well as reduce maintenance costs and vendor audit risks. Enterprise Integration, in our partnership with Eracent, can help customers with license management and reconciliation. ITMC DiscoveryTM provides enhanced functionality for numerous publishers and license types allowing companies to be compliant with complex software vendor licensing. Continuous License ReconciliationTM (CLR) delivers comprehensive license management including usage data, optimization recommendations, license allocations and reconciliation, and alerts. This solution also generates reports allowing your organization to perform continuous internal compliance audits. Ongoing monitoring and tracking ensures that that your company is headed in the right direction while investing in an automated SLM gives your company a clearer strategy for future decisions.